Ganfeng Lithium reported Q3 revenue of RMB1.26Bn (US$176M), up 3% from RMB1.22Bn (US$170M) in Q2 as lower prices offset increased volumes (Roskill estimates 10.4kt LCE vs. 9.2kt LCE in Q2). Higher costs also ate into profits, down 33% from RMB463M (US$61M) to RMB312M (US$44M) due to increased operating expenditure and Hong Kong listing expenses. GanfengÃ¢â‚¬â„¢s H-Shares were officially listed on the HKSE on 11th October rasing US$421M, with LG Chem taking an 11% share alongside an off-take agreement for 92.6kt LCE of lithium hydroxide. 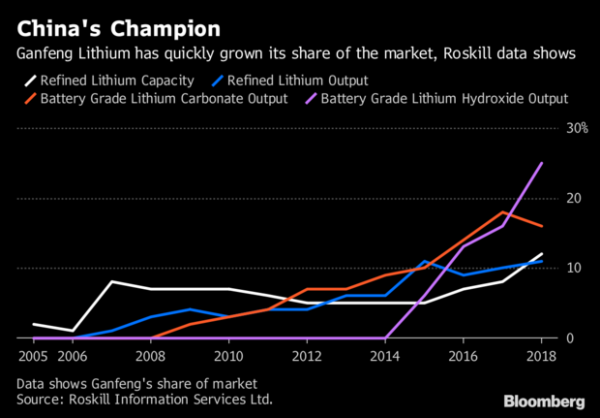 Ganfeng also recently signed off-take agreements with Tesla and BMW as automakers lock-in lithium supply. GanfengÃ¢â‚¬â„¢s inventory swelled to RMB1.4Bn (US$200M) as the company stockpiled spodumene ahead of full operation of the new 17.5ktpy lithium carbonate and 20ktpy lithium hydroxide plants which are now being ramped-up, with another plant planned with the proceeds of the IPO. Ganfeng has also committed more funds to the Minera Exar Cauchari joint venture project with Lithium Americas in Argentina, paying US$87.5M (plus an additional deferred payment of US$50M) to SQM and now holding 37.5% of the project. As well as its own share of the project costs, Ganfeng is also funding an additional US$100M of Lithium AmericasÃ¢â‚¬â„¢ obligation to the capital costs, alongside US$125M commited previousely, and will receive 70% of Lithium AmericasÃ¢â‚¬â„¢ share of output. In total, GanfengÃ¢â‚¬â„¢s share of output from the 25ktpy project will be 20.3kt, with Bangchak Petroleum taking 2.4kt following its US$113M investment in 2017. Time will tell who is right - Mac + MS or the other "experts"
Lithium stocks have taken a beating because investors donÃ¢â‚¬â„¢t understand the lithium supply chain an analyst told a Melbourne mining conference on Tuesday. But Canaccord Genuity mining analyst Reg Spencer reckons there is Ã¢â‚¬Å“a lack of understanding in the depth and the complexity of the supply chain and thatÃ¢â‚¬â„¢s confused a lot of investorsÃ¢â‚¬Â. That misunderstanding is Ã¢â‚¬Å“leading to volatility in share prices from many companies that are operating in this sector,Ã¢â‚¬Â Mr Spencer told the International Mining and Resources Conference. SQM is one of the oldest, largest and most profitable producers of the mineral used in rechargeable batteries for vehicles. On Friday, it revealed a five-week delay in a project to take annual capacity to 70,000 from 48,000 metric tons. With the degradation of the salars, I can see a bunfight brewing. Though we are a long way from Stop Albemarle T-shirts. And it would be a fair bet Tibet gets done over. Trouble brewing at the Atacama Salar in Chile. A version of the tragedy of the commons where both lithium companies seem intent on grabbing as much brine as they can no matter what the long term consequences may be. Working on the theory that problems for your competitors is good news for you the lithium brine stock I follow, Orocobre, which operates from a different salar, in northern Argentina, may attract more intention from investors as a result of these concerns in Chile. Anyway, we'll find out how Orocobre is managing its own production problems as we should get to see their September quarter production figures in the next few days. With a ruined 13th Century castle, the Irish town of Carlow is an unlikely staging post in the super-charged rise of a key player in ChinaÃ¢â‚¬â„¢s push to dominate the global electric-vehicle revolution. Ganfeng Lithium Co. sent a team to the town -- a 90-minute drive southwest of Dublin -- in 2013, shuttling between prospective lithium deposits dotted through the verdant countryside. It was part of their companyÃ¢â‚¬â„¢s first foray outside China amid a drive to boost production of key materials needed to make rechargeable batteries. Federal Labor says it wants to Ã¢â‚¬Å“superchargeÃ¢â‚¬Â AustraliaÃ¢â‚¬â„¢s involvement in the lithium-ion battery sector and is promising to back WA with research dollars and access to infrastructure and manufacturing funds worth billions to do so, if it wins government. A report by AustraliaÃ¢â‚¬â„¢s chief resources economist released yesterday said Australia could reap Ã¢â‚¬Å“hundreds of billionsÃ¢â‚¬Â from an explosion in the use of lithium batteries, saying that all the materials required to make them could be found in WA. Shadow resources minister Jason Clare told WestBusiness a Federal Labor government would make downstream processing of battery metals mined in Australia a policy priority, promising to back the industry with research grants and priority access to the $5 billion Northern Australia Infrastructure Facility. Labor has also promised to establish a $1 billion Australian manufacturing future fund to extend loans for local manufacturing plants, which would also be available to miners and processors wanting to add value to raw minerals mined in WA. Ã¢â‚¬Å“We want to support them to take the next step further down the supply chain,Ã¢â‚¬Â he said. Mr Clare said Labor would also make research into battery metal processing a funding priority for the Federal GovernmentÃ¢â‚¬â„¢s multibillion-dollar Australian Research Council grants program. Speaking to WestBusiness in Perth yesterday after an industry roundtable attended by Prime Minister Scott Morrison, Federal Resources Minister Matt Canavan said the Government would take a lead role in promoting AustraliaÃ¢â‚¬â„¢s lithium and new minerals potential overseas. Ã¢â‚¬Å“And IÃ¢â‚¬â„¢d also like to see and consider how we can better co-ordinate our infrastructure investment to support the development of new projects,Ã¢â‚¬Â he said. Senator Canavan said the Government was considering a range of proposals put to it by the Association of Mining and Exploration Companies and the WA lithium sector, including concerns about the GovernmentÃ¢â‚¬â„¢s planned research and development tax changes, which introduces a $4 million cap on rebates for junior companiesÃ¢â‚¬â„¢ spending on R&D. However, he said the Government had made its decision after considering reports and he thought the changes would receive widespread support in Parliament. Battery manufacturing would be trickier but could be made feasible if Australia started refining high-grade battery materials and had an established electric vehicle market. "AustraliaÃ¢â‚¬â„¢s prospects for entry into (battery manufacturing) are mixed. Australia would likely need to be strongly established at all previous stages of the supply chain in order to position itself for battery production," Mr Cully said. "The presence of an electric vehicle assembly plant in Australia would also boost the chances for a connected battery facility, though such a development would likely be contingent on a successful expansion of electric vehicles onto AustraliaÃ¢â‚¬â„¢s roads." Mr Cully warned time was of the essence to ensure Australia maximised its lithium opportunities. "Given the pace of change and efforts now under way to solidify the supply chain, it is likely that key decisions around the future of lithium in Australia will need to be made within the next few months," he said. Perth-based Lithium Australia managing director Adrian Griffin said the report confirmed what they already knew, that Australia could play host to a battery industry. "That's why we're doing the research work we're doing that has taken materials from mine waste right through to lithium-ion batteries. It can be done," he said. Mr Griffin said the report highlighted the need for the battery materials sector to have access to open-ended research and develop tax incentives. Association of Mining and Exploration Companies chief executive Warren Pearce said Mr Cully's report neatly summarised the enormous opportunity faced by Australia in lithium and battery minerals. Mr Pearce said the association would ask for strong leadership from the federal government to grasp the battery minerals opportunity. While lithium is the buzz resource the report showed it still had a long way to go to reach the economic injection from traditional materials like iron ore, gas, coal and gold shot. AustraliaÃ¢â‚¬â„¢s chief resource economist says WA could earn Ã¢â‚¬Å“hundreds of billions of dollarsÃ¢â‚¬Â by taking advantage of its battery-making mineral wealth but has warned governments must act quickly to capitalise on the opportunity. Traditional exports of iron ore, coal and liquefied natural gas Ã¢â‚¬â€ expected to increase 55 per cent to $48 billion this year Ã¢â‚¬â€ will remain AustraliaÃ¢â‚¬â„¢s dominant commodities. The key to those riches, Mr Cully says, is WAÃ¢â‚¬â„¢s long-held dream of a hosting a genuine downstream processing industry, which could lift the value of lithium exports from about $1100 a tonne for mineral concentrate to about $23,000 a tonne for refined products such as lithium hydroxide.